We are proud to be responsible for protecting, growing and managing sizable investments for the University at Buffalo. What does the endowment support? Our goal—which we consistently achieve—is to control risks while generating resources from the total investment portfolio, which ensures a reliable return on these funds. This provides UB with a predictable and substantial source of revenue, allowing UB to fulfill its mission. A strong endowment ensures a certain level of financial stability for UB, an institution that is expected to last in perpetuity. We are committed to helping grow the endowment for the betterment of the university. In keeping with best practices, only the returns on the principal are made available for spending; the endowment principal is protected and invested in order to ensure the buying power stays consistent over the years. At June 30, 2018 the market value for total investments of the University at Buffalo Foundation and Affiliates (UBF) amounted to $1.026 billion, as compared to $940.4 million at June 30, 2017 and $842.5 million at June 30, 2016. Endowment funds included in total investments amounted to $725.0 million at June 30, 2018, as compared to $659.2 million at June 30, 2017 and $601.0 million at June 30, 2016. These funds are managed under the supervision of UBF’s board investment committee. More than 80 professional investment firms currently share in the administration of the portfolio, with performance monitored by the trustees. Included in this total are certain investments, known as the Long-Term Portfolio and having a market value of $1.000 billion at June 30, 2018, which are managed and administered on a pooled basis. The primary investment objective is to maximize total investment return while preserving the inflation-adjusted purchasing power of the portfolio. This should provide a relatively predictable, constant and stable (in real terms) stream of funds for current use. Total investment return is the sum of interest, dividends and capital appreciation. Investment performance, on a total return basis net of fees, is most appropriately reviewed over the longer term with benchmarking to proper indices. Policy Benchmark returns are average returns of indices weighted consistent with portfolio allocation (see Key to Indices). 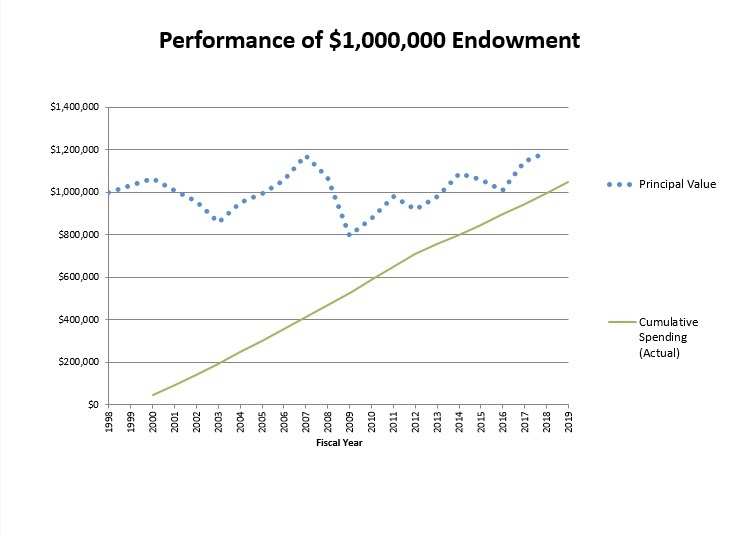 The accompanying chart reflects performance for the Long-Term Portfolio in comparison with over 800 other colleges, universities, endowments, and foundations across the country. The proper and prudent distribution of investments among various asset classes allows us to honor spending policies, maintain risk tolerance and stability, produce appropriate investment returns, and achieve long-term objectives. NOTE: Long-term target is goal for 2022. Spending is defined as funds made available annually from the Long-Term Portfolio for university programs and administrative expenses. Spending on university programs will be approximately 4% of the donor’s entire original contribution after the first full year of participation in the Long-Term Portfolio. Afterwards, spending will increase annually at the average rate of inflation, regardless of market performance. This approach provides a stable and predictable annual stream of funds for use that maintains its purchasing power over time. The Spending Rate will be determined and approved annually by the Investment Committee. The desired result is to achieve a year to year spending increase for individual funds that approximates the Inflation Rate (Footnote 1), not to exceed 3%. Total Spending is limited to a floor of 4% and a ceiling of 6% of the three-year average market value of the Long-Term Portfolio, measured on a quarterly basis. Special spending rules are followed for individual endowments where the value has fallen below historic dollar value. Footnote 1: Inflation rate is the average of the Higher Education Price Index (HEPI) and the Consumer Price Index (CPI) for the most recent three calendar years. A $1,000,000 gift on July 1, 1998 invested in the Long-Term Portfolio would have been worth $1,188,950 as of June 30, 2018, prior to the Fiscal Year 2019 distribution. In addition, $1,049,557 would have been cumulatively distributed in total from Fiscal Year 2000 through Fiscal Year 2019, with annual spending growing from $44,592 in Fiscal Year 2000 to $51,875 in Fiscal Year 2019.